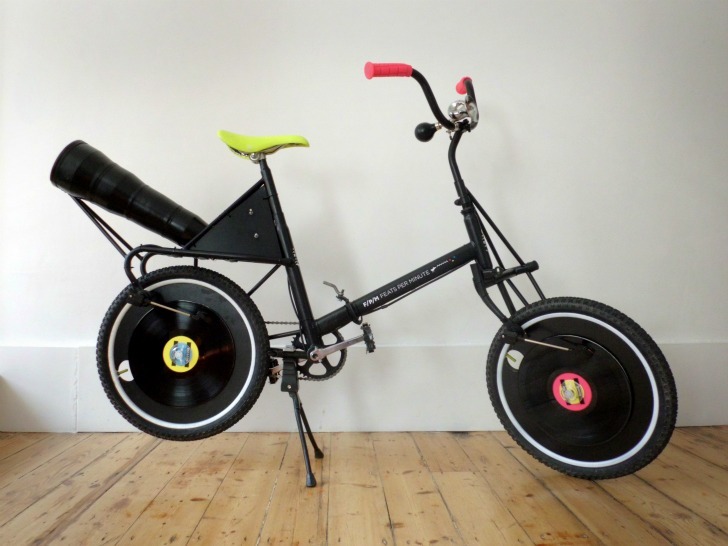 There's nothing better than taking off on a bike with your favorite music in tow - and now a group of dutch designers have teamed up to create an amazing record-playing bicycle! 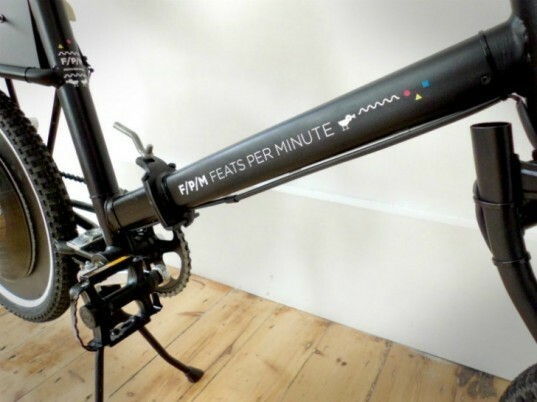 Dubbed Feats Per Minute (a pun on 'fiets' - the dutch word for bicycle), the bike is outfitted with a set of wheel-mounted turntables that play music as you pedal. The collaborative team consists of Merel Slootheer, Liat Azulay and Pieter Frank de Jong. Working together they dreamt up a way to combine their skills in graphics, illustration and industrial design into a brilliant record-playing bike. The team began with a thirty year old Alpina bike, which they upgraded with parts salvaged from dissected vertical record players. They sought to keep the design as low-tech as possible – the only outside energy source is a nine volt battery that power the amplifier. The tempo of the music varies according to how fast you pedal, so different styles of music are better suited to different speeds – ballads are about 60 BPM, disco is around 120 BPM, and house music ranges from 170-300 BPM. Feats is the first prototype built by the trio, but they are expanding and hope to go global with a bike in every city. The bike takes musical machinery to a whole new level, and we can’t wait to see how the project develops. The tempo of the music varies according to how fast you pedal, so different styles of music are better suited to different speeds - ballads are about 60 BPM, disco is around 120 BPM, and house music ranges from 170-300 BPM. The team began with a thirty year old Alpina bike, which they upgraded with parts salvaged from dissected vertical record players. They sought to keep the design as low-tech as possible - the only outside energy source is a nine volt battery that power the amplifier. Feats is the first prototype built by the trio, but they are expanding and hope to go global with a bike in every city. The bike takes musical machinery to a whole new level, and we can't wait to see how the project develops. The collaborative team consists of Merel Sloother, Liat Azulay and Pieter Frank de Jong. Working together they dreamt up a way to combine their skills in graphics, illustration and industrial design into a brilliant record playing bike. The bike was transported to London to be exhibited.